the netherlands | "Name On The Trophy"
Some happy Holland fans, hopefully it'll all end in tears. Bill Shankly once said of Everton: “If they were playing down the bottom of my garden- I’d draw the curtains. While that may have been true from every Liverpool manager’s benchmark, the prospect of the Netherlands training in my ‘garden‘ made me do anything but draw the curtains. Staying in Witwatersrand University in Johannesburg for the duration of the World Cup, I was informed that the Dutch team would be training in the stadium next to my block. Despite a trip being organized by the tutor who’s leading the newsroom I’m working on for the next four weeks, which involved looking at Lions and Elephants, I decided I could always see Elephants anytime, but how often do you get the chance to see Dirk Kuyt miss from 2 yards? So after grabbing a ticket from the University office- which was for the Grandstand seating no less- I joined the many assembled Dutch fans in the queue as we waited to be let in. 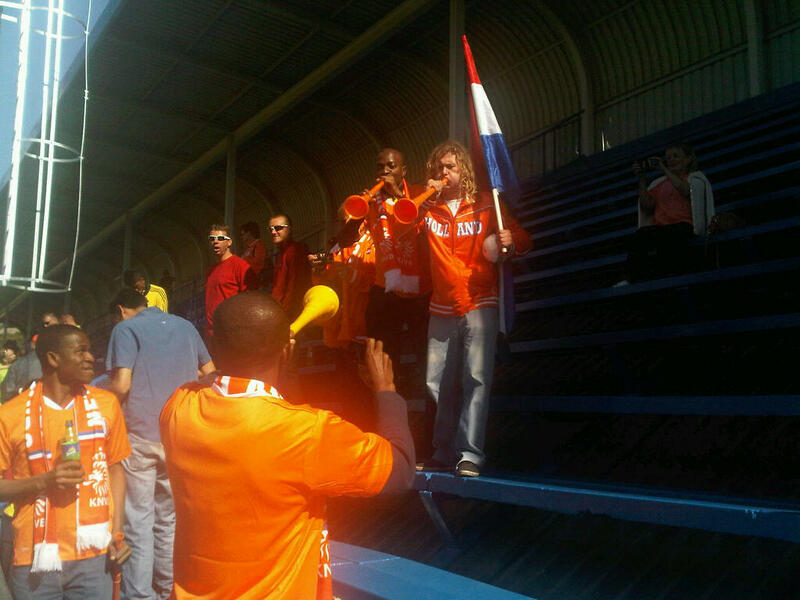 Holland are well supported here in South Africa as many white South Africans or Afrikaans are descended from the Dutch. The Dutch fans mainly seemed to be South African residents although there were still a few who’d made the trip from the country that gave us legalized weed and clogs. After two Wits Uni’ students and I had taken our seats in the Grandstand- think Unibond Prem- we waited for about fifteen minutes before the team arrived on the pitch. Looking out into the ‘Sea of Orange’, sorry I promised myself I wasn’t going to say that but couldn’t help it- it struck me that there must’ve been at least a few thousand who’d turned up to see Bert Van Marwijk’s men. As the team walked onto the pitch the sound of Vuvuzela’s –which had already been blaring intermittently- rose to a crescendo –with the shouts of ‘Robin’ or ‘Ryan’ or ‘Manchester United’ -for some inexplicable reason- barely audible. While the players had a bit of a breather I spoke to a couple of fans to see how they viewed their team’s chances. After finally finding three lads from Holland- at the tenth time of asking- I got the lowdown on just whether they thought they really could go all the way. Moike Sovavacs- I think that’s its name but to be honest he’s a little drowned out by Vavazula’s – from Rotterdam. When asked how well he thinks Holland will do he says he believes they will be champions, pointing at his friend before adding he is from Brazil and even he thinks Holland are the best. Speaking about the group he says with a big smile that he thinks it’s very easy and not until the second round does he expect any difficulty. When I ask him which is the best Dutch player his smile fades slightly : “Robben….but he don’t come here. When I ask him which teams he’s wary of, he lists Argentina, Brazil, Germany and Spain. Again he believes the group stages will be easy and laments the loss of Robben but believes Wesley Sneijder is good enough to shoulder the burden, he also expects to meet Argentina in the final. 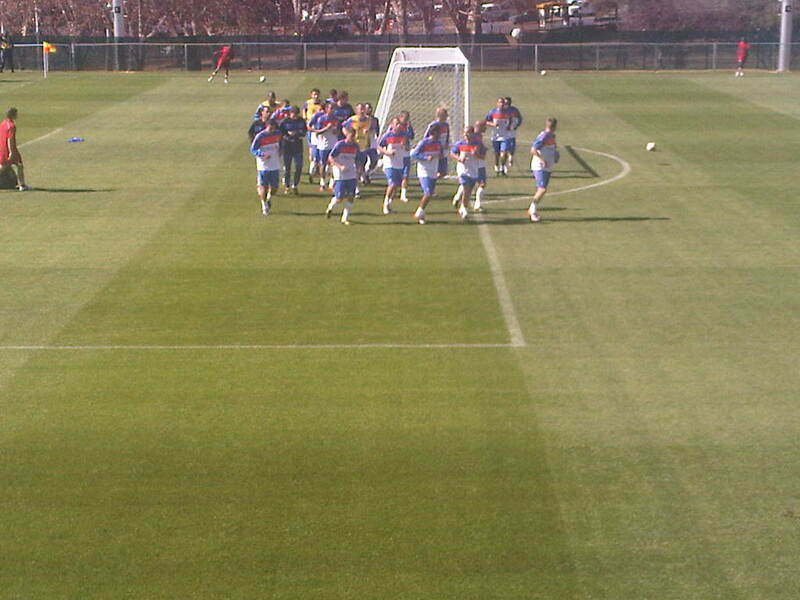 It’s now time for the Dutch team to play a match against each other so after the player’s move the goalposts to the edge of the 18 yard box, the game kicks off. It was a fairly routine affair, with Dirk Kuyt volleying wide from two yards, Robin Van Persie looking a tad rusty to be perfectly honest and Sneijder holding onto the ball well. Klaas Jan Huntelaar rifled a first half winner, while Rafael Van Der Vaart hit the bar from twenty yards with the last kick of the game. There was a slightly shaky moment for the assembled fans when Sneijder started limping and holding his foot after a challenge but he soon ran it off. Overall the Dutch looked pretty impressive with Sneijder and Van Der Vaart being particular stand-outs. I grabbed another fan just before the end and asked him the same questions I’d posed earlier- he was a little bit more pessimistic than the previous two, stating that he was worried about Argentina and Brazil- although he felt confident that they’d get through the group easily. The team then did a final lap with much of the crowds chanting seemingly reserved for Robin Van Persie- although it was difficult to hear much as there were a few vuvuzela battles going on near me. It struck me that none of the fans I’d spoken to, including the two South African students I’d gone to the session with, rated England as one of the top teams, maybe that’s a good thing, but who knows? 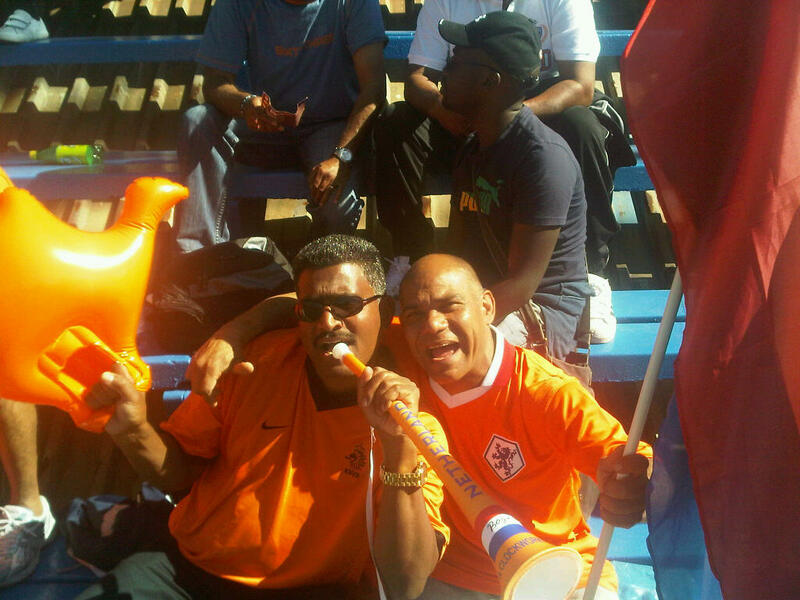 Vuvuzela battles- be afraid, be very afraid. The sun was shining as we left the stadium to the sound of more vuvuzela’s- yes they do get very annoying and I’m dreading to think what several thousand are going to sound like- all in all not a bad way to spend a Wednesday afternoon.